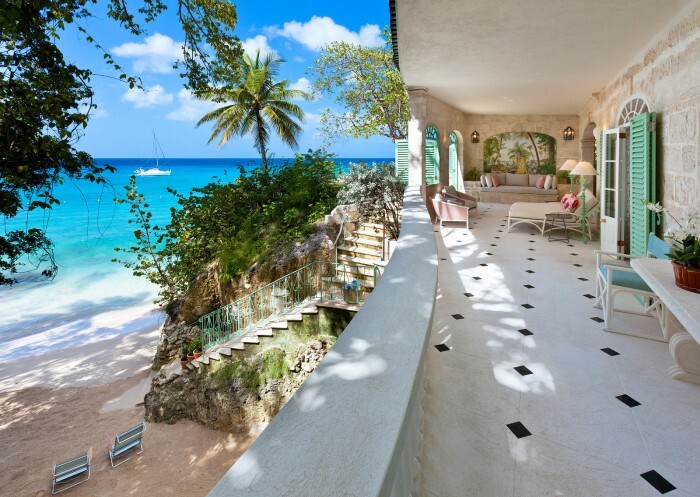 Nestled in the Sandy Lane Estate on the West Coast of Barbados, Elsewhere is a luxury villa suffused in greenery that transports you to a mythical space between the ocean and the clouds. Arise to the antics of green monkeys in the gardens, observe the hummingbirds, sailing ships and flowering trees by day and catch the soul-stirring views of the sunset each evening. The breeze constantly flows through the various courtyards, patios, loggias, balconies and terraces of this villa that sprawls over two acres on a ridge with sweeping views. The main house has two wings with six en suite bedrooms, a living room, covered patio, kitchen, and courtyard. A charming loggia and bar area overlooking the front and back gardens is one of the focal points of the house. The pool house has two en suite bedrooms above a large poolside lounge area and bar. A charming garden cottage, with a living room and two en suite bedrooms, opens to a private lawn and mahogany grove. Elsewhere is a five-minute drive (or a 15-minute walk) from the beautiful Sandy Lane Owners Beach Club where guests have free access to a beach cabana, chaise lounges, umbrellas, snack bar, washrooms and showers. Some of the best restaurants and duty-free shopping in Barbados is close at hand as are some of the island’s most desirable golf courses. Our chef Debra is world class, and the entire staff is warm and welcoming. Additional hands will ensure your drinks are topped, clothes spiffed up and massage is booked. Elsewhere has every imaginable amenity from parking space for six cars, high-speed internet throughout, a fully equipped gym, air conditioning in most spaces, flat screen televisions, high-quality speakers, and a top-notch security system…there’s magic everywhere, from its fabled hanging gardens to endless vistas, waterfalls and whistling frogs. It lifts the spirits and forces you to discover what lies beyond. Once you stay here, you will always want to be “Elsewhere”. 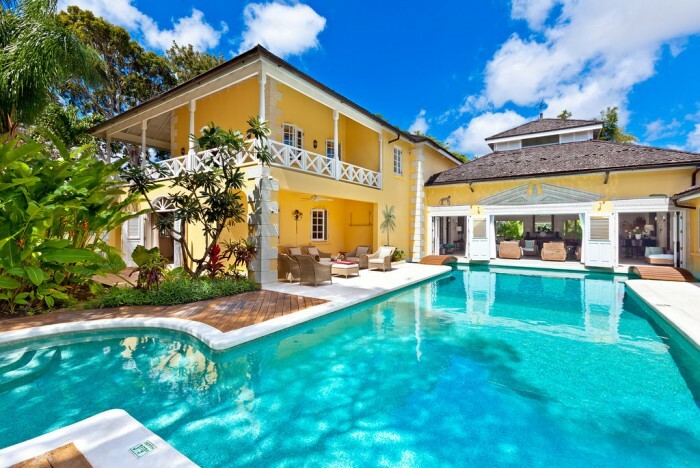 Jamoon is a beautifully furnished, charming and private private villa in the Sandy Lane estate, built around a swimming pool and surrounded by tropical gardens, conveniently located a short distance away to duty-free shopping, pristine beaches and an array of fabulous restaurants in Holetown. This magnificent traditional home has been resorted in all the best ways, retaining much of its original charm but with modern features, perched on the edge of a cliff within 1.7 acres of tropical gardens, a multitude of living areas are designed to provide a memorable holiday for any family, group or corporate gathering.